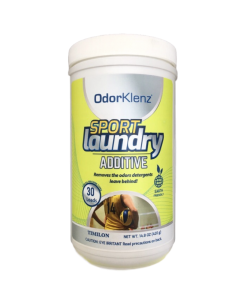 The OdorKlenz Laundry Additive is a favorite among our customers because it provides complete odor elimination from such a wide array of sources. Our patented formula is made from earth minerals and non-toxic ingredients so you will not expose your clothes to harsh chemicals, dyes, or perfumes. We also never rely on masking agents so odors are truly eliminated, not merely covered up or mixed with other obnoxious smells. Forgot to switch out the wash? Get a redo with a little bit of OdorKlenz in a rinse cycle to eradicate that mildew smell. Working in the garage all day? Drive out that stubborn grease aroma. Working up a sweat? Knock out that gym bag stench. Even notoriously difficult towels cannot cling onto musty odors when they are washed with OdorKlenz. 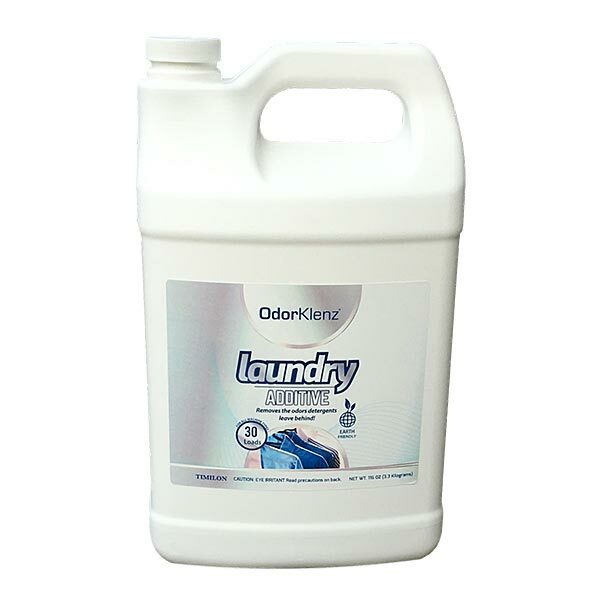 Safe for use on any washable fabric including moisture wicking, spandex, polyester, rayon, and wool, this laundry additive works alongside your normal detergent to neutralize odors on a chemical level. Most detergents are blended for stain removal which is an important aspect of getting your clothes clean. OdorKlenz offers the equally important step of eradicating odors. Have confidence with an odorless wardrobe and trust that your linens will be free of any funky smells when guests come to visit. Our liquid additive is perfect for soaking delicate fabrics which need refreshing (like that vintage piece you scored at a thrift store!). Simply add a little bit to warm water and let it sit for 20-30 minutes with occasional agitation and then rinse off and dry! Safe for use on cotton, personal delicate, nylon, polyester, spandex, washable lace, washable rayon, washable wool, and all other washable fabrics. Go here for more information on how to use OdorKlenz Liquid Laundry. Love it. Took the mildew smell out of my towels! So far, so good. Towels no longer smell. OMG this product is awesome. I had problems getting odor out of my daughters hoodie and sons pajama pants. I tried everything and nothing worked. Odorklenz got the smell out in just one wash and not only did it get the odor out, it got the odor out of my washing machine as well. Absolutely love this product. I bought this for someone who wears a uniform in a fast food place (constantly smells like stale fries) and after first wash with Odorklenz, 90% of the smell is gone. Looking forward to tackling future smells and getting great results. Good product, it does what it says! Will purchase again! Worked pretty good, and definitely made a difference! I have ordered this three times now. It lasts a long time and really does work!! It gets out all the odors in bedding and sports clothes as well as work clothes. It can be pretty dusty and smelly in Arizona as it is so hot most of the time. I have tried many grocery store products but nothing works until I found this. I love it!!! Love this! Saved my sheets from being thrown away. After reaching my wits end with smelly towels and nothing helping I found OdorKlenz! Works great and best of all, it’s not toxic! I’m very pleased with the results. It works. The urine smell is gone from my mothers clothes. I did use more than a 1/2 cup—more like 3/4 to 1 cup. I highly recommend Odorklenz! I love this product! Clothes are cleaner than ever before! This product WORKS! I have dogs and it got rid of the dog smell in the bedding. That’s amazing! I rescued some fantastic vintage wool items that had been stored for more than a decade in a teak trunk with literally dozens of BOXES of mothballs. After hanging them outside all summer several were still too smelly (and presumably toxic) to wear. I had my doubts that any laundry additive would help. I soaked the first garment for several days in a couple of gallons of water with probably a cup of OdorKlenz (agitating it occasionally), drained it all really well (still smelling so awful that I got in trouble for poisoning the bathroom), and then threw it in the laundry by itself with regular detergent and a half cup more OdorKlenz. I ran it in warm water even though it was wool, figuring it was ruined if the scent didn’t come out anyway. After a roll in the dryer with no heat and a day of lying flat to dry, I stuck my nose in the wool and was surprised to find it didn’t smell AT ALL! It will be well worth the modest cost to rescue these fabulous items, which obviously had no moth damage… just lingering migraine-inducing chemicals. WILL BUY AGAIN!!! I did a load of my husbands work clothes, I was surprised that OdorKlenz Laundry Additive worked great and took the odor out, finally something that works! Works great, will be reordering more! Really loving this Product really takes the smell out!! Finally something that removes odors from my towels and work clothing. My front loader washer stinks, OdorKlenz works and my towels smell clean without fabric additives…. Thanks OdorKlenz…. Love it! It works really well! Terrific product that I can highly recommend to anyone who purchases clothing from thrift shops or charity shops that have that funky, musty odor. I washed some very stinky sweaters using OdorKlenz and they are like new and have NO odor! After several methods of trying to get rid of the dye smell on my jeans I finally found one that works after the first wash. Highly recommend it. I was skeptical about buying this, but it made my teenage boy’s clothes smell 100% better!!!! I LOVE this product. Our workout clothes smelled like the GYM. They were awful! I tried everything, all the online recommendations. It wasn’t until I started using this product that we now smell CLEAN. I add a half of cup in with my laundry detergent. I don’t change how much laundry detergent I use. I do use the warm cycle which is recommended for these types of clothes. Of course, don’t dry these items! Worked great for our needs! We let our friend try it for her son’s bedding odors, worked great! I tried it as an “I’ve tried everything else, why not?”…effort to get the smell out of my towels…I followed the directions and am very impressed…the smell was gone after the first wash. I now use it 1-2 times a week and the smell is not coming back! Thank you! It really works! I tried scrubbing, baking soda, vinegar, etc. to remove armpit odor from my husband and teenage son’s t-shirts. It was taking too much time and not working the best. I didn’t have to pre-treat with OdorKlenz. Just added it to laundry with detergent and no more odor! What a relief. I couldn’t believe it! I go through this monthly! I use this on my son’s stinky wrestling clothes and my hubby’s work-out clothes. This is the first product that I have found to take the odor out of clothes and towels! This works in half the cases I´ve tried. Synthetic materials are toughest to clean. I was unable to remove the odours from textiles previously washed with fragranced laundry detergent. Still, handy product many times. The washer in the house that we’re renting was so scented that my clothes picked up the scent even though we were using a detergent that is fragrance-free. While the scent in the clothing was minimal, it was enough to bother my allergies. This product was able to eliminate the fragrance when I re-washed the clothing in a fragrance-free machine. I don’t know how it would work for clothes that had intentionally been washed in a detergent with fragrance or with scented dryer sheets. I can’t believe that it removed all the rubber odor from my husband’s work clothes and my washer didn’t smell horrible nor did my laundry room. This will definitely be in my laundry routine from here on and I encourage you to check it out and try it for yourself. I promise it’s affordable and you won’t ever wash clothes without it again because I sure haven’t. Awesome got rid of the mildew smell! I bought this after seeing a YouTube video and I’m so very happy I did!! I’ve had a few musty smelling towels that I’ve tried to get clean with vinegar, baking soda, & every detergent I could think of but nothing worked. That is until this product!! Amazing!!!! It took the mildew smell from my towels. It’s a little pricey, but I didn’t have to buy new towels, just yet. Good product, would recommend! I love you guys! This is the first product I have ever used that ACTUALLY takes the urine smell out of puppy pads! I breed puppies and I can finally use something that will truly keep my clothes odor free! I bought this product based on all the positive reviews that the product really does eliminate body odor. I am so happy with the results of the product that I am buying more!! My husband does martial arts 5 days a week for hours in a non-air conditioned facility. He washes his uniform and lets it air dry every day. I could smell his uniform in the laundry room everyday after it had dried. This product has totally taken the body odor out of the uniform after every wash! it doesn’t take much and lasts a long time! This is the only product I have found to ever take out odor!!! This stuff is amazing! It gets all the nasty smells out of clothes. Just wish it was a little cheaper. Fixed my problems after the first watch. I have been dealing with the smell for many years. I am very happy and am planning on using it as maintenance from now on. I needed to find a product that would freshen up active gym gear (teenage wrestling/ gym clothes). This worked PERFECTLY 🙌🏼. I even used this on towels, uniforms, etc. to freshen them up for any lingering odors. It really takes away musty smells and/or any unpleasant odors. Follow instructions. I did the pre-soak according to instructions and it worked great! Highly recommend!! The best thing ever!! It really works! It works. I don’t know what it is but everything smells fresh. Very good product. Worth the expense. OdorKlenz helped get rid of the musty smell in our towels. Love it! So I have a Levi trucker jacket with fleece lining. I bought it from the Levi store in black and all of these had this very odd odor to them and was very unpleasant. I asked about it before I bought one and they said to wash it and the smell would be gone…. well after several washings and several other things I figured I would give this a shot AND IT ACTUALLY WORKED! Great product! It works, yes it does! I’ve tried every laundry product out there to get rid of the various odors that come with children and animals, and while some others work at least some of the time, this is the first one i’ve found that completely eradicates all odors and doesn’t leave any powders or oils or “pleasant scent” of its own. Buy some! Sure, it’s annoying to pay to have laundry products shipped to you, so buy the biggest size – the shipping’s nearly the same for all the sizes. You’ll be happy with it. You might even be happy with me for telling you about it. I have been using the Laundry Liquid and it works great! I bought this for my stinky wash clothes and towels. It works pretty well in the wash but better if you soak them in it first. So far every stinky thing I’ve washed or soak in this has come out smelling good! Took perfumes, rancidity & many other chemicals out of my clothes. Some chems or perfumes took more than one wash or had to soak. My daughter traveled to the Dominican Republic a few weeks ago. The dorms they stay in are cement block buildings and are very damp with the humidity there. Every time a family member travels there, the clothes come back with a very strong musty smell that I cannot remove. I have tried everything from vinegar to baking soda, febreeze and laying things in the sun. Nothing worked. OdorKlenz had finally done the job!! I used it along with my detergent and the sanitary cycle on my machine which uses very hot water. I’m impressed to say the least! OdorKlenz is amazing!!! Works wonders on our towels! The OdorKlenz Laundry Liquid helped to remove the mildew smell from my towels. This completely got rid of the stale smell that my towels always have after they are washed. I also used it on my baby’s spit up on my clothes and it worked very well! I was extremely impressed with this product!! I have used it on our dog beds, sports clothing & it even got that slightly musty smell out of our older towels!!! This has worked so well on my workout clothes! It is a wonderful product! I have used the OdorKlenz with a couple of loads of laundry and it has worked great. I’m excited to continue using it. All I wanted to say was, I just took my first load of towels out of the dryer after using your laundry additive and OMG!! They have zero mildew or old smell!! I’m so in love with this product! Thank you so much!! I’ve spread the word on my Facebook to all my other mama friends that this is a must needn’t laundry staple!! This product works great! Thanks OdorKlenz. I had some grapeseed oil that got on my clothes and nothing else would get the smell out. After one soaking with this product the smell was completely gone! I love it! This completely gets rid of the musty towel smell. I just received my laundry liquid and used it on my first load. It worked! I am enjoying this product! This worked great on my clothes! So far so good! This is a wonderful product! It is working so well for me. I found out about OdorKlenz from my favorite YouTuber. I thought why not and try this product out when I was my towels. After trying the product, I have to say that it worked great! I purchased some for my mother and know that she will be very happy when she receives this product. I’ve been using this for my tougher loads of laundry and it’s working really well! Used this product on my towels and was I thoroughly impressed with the results. I also got the sport powder and excited to try it out! This worked so much better than the last brand I tried. I can’t wait to order more! My son’s clothes had a mildew problem and nothing I used to get rid of the smell worked until I found this product. It completely got rid of it! I have tried many, many products over the last year to get rid of the smell of urine in my grandmother’s clothes. She, unfortunately, has incontinence issues and was very embarrassed by this. Her embarrassment was made worse when her clothes would carry the smell no matter what I did. This is the first and only product that completely got rid of the smell! There is no smell from the product. No sticky residue. Just fresh smelling clothes! OdorKlenze helped get rid of the musty smell in our towels. Love it! It worked better than any product I’ve tried before. Took out musty odors from my laundry. Very satisfied. I go through this monthly! I use this on my son’s ‘stinky’ wrestling clothes and my hubby’s work-out clothes. This is the first product I have found to take the odor out of clothes and towels! It took the mildew smell from my towels. It’s a little pricey, but I didn’t have to buy new towels, just yet. Good product, would recommend. t really works! I tried scrubbing, baking soda, vinegar, etc. to remove armpit odor from my husband and teenage son’s t-shirts. It was taking too much time and not working the best. I didn’t have to pre-treat with OdorKlenz. Just added it to laundry with detergent and no more odor! What a relief. I couldn’t believe it! Thank you for saving my health and giving me peace of mind. I came to the Internet looking for ways to get perfume odor out of clothing. I have a sensitivity to odors and react as if I had asthma. Second hand smoke, perfume, soap smells, anything that has a scent will close up my airway. My laundry detergent that I had used for 20 years changed and now has a perfume scent. I could not wear the washed clothes. Soaking my clothes in the wash with vinegar and/or baking soda did not work no matter how many washings. So I was desperate when I found this company Timilon Industries and tried their OdorKlenz laundry additive. The clothes were scent free with the first wash!!! I hung the shirts to air dry and checked every day for any scent, thinking the odor would come back. It NEVER did. the problem was solved. What a miracle! Is this product safe to use on all my clothing? Please follow fabric care instructions on the label. If the garment is water sensitive, you should use caution when using the OdorKlenz Laundry Additive. Our products needs water to help create the contact between our active materials and the offending odor source. We have not added any perfumes or fragrances to our product. We believe that if the goal is to eliminate odors, you should not be adding odors or covering them up. 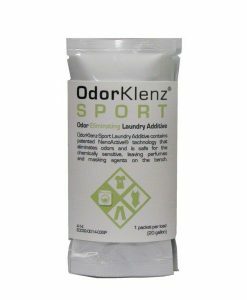 Can I use the OdorKlenz Laundry Additive to soak clothing followed by a hand wash? Yes you can. We would recommend our liquid version of the product for this type of application as it disperses better in situations with lower agitation and takes longer to settle. The easiest way to do a soaking step is in a sink or washtub with warm water. You would want to make sure the size is big enough for the clothing. Start with the warm water, add the OdorKlenz Laundry Additive and mix to disperse. Then add the clothing and let it sit for 20-30 minutes and give it the occasional mix to suspend the product in the water. You can let it sit longer if you would like. Then after the soaking, the clothing can be rung out and then taken straight to the washer to do a normal wash cycle with detergent. What is the difference between the powder and the liquid? The actives are the same, the difference is just the dispersal material. In the liquid version, it is water, in the powder version it is soda ash. For soaking applications, we recommend our liquid version of the product. Is this safe to use on my workout clothes to remove sweat odors? Yes. We suggest a fragrance-free standard detergent. Can the OdorKlenz Laundry Additive be used to remove fragrances and perfumes? Yes. Depending on the severity/saturation of the perfume, a soaking step may be needed. How effective will this be at removing chemical odors from new clothing? It depends on if the clothing was intentionally treated with the chemical or not. Some fabrics have chemicals bonded to the fibers, often for wrinkle prevention or some other protection. These can be difficult to remove as they have effectively been engineered to be part of the garment. Other new clothing smells are a result of the shipping and packaging of the product and OdorKlenz Laundry Additive is effective against those odors. Can I use this along with vinegar in my wash? We do not recommend that as our OdorKlenz Laundry Additive will want to neutralize the vinegar effectively canceling the benefits they each offer out. 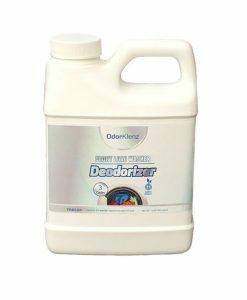 Will the OdorKlenz Laundry Additive remove musty smells from my front load washer? 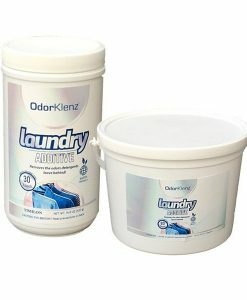 Can I use the OdorKlenz Laundry Additive in a High-efficiency (HE) washing machine? Yes. With the wide range of options available on newer HE machines, please make sure that any pre-rinse setting are turned off. Some machines do a very quick rinse of the tub at the beginning of the cycle and we don’t want our product to be rinsed out before it has a chance to work. For more information and tips, please see or request our best practices sheet for this product.